A mural located on the landing between the first and second floors celebrates the Commedia dell‘Arte, a form of improvisational comedy that flourished in 16th and 17th century Italy. 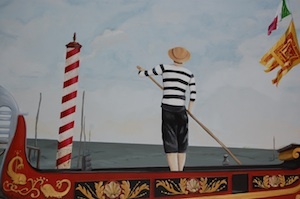 The mural offers a view of Piazza San Marco in Venice with the Commedia dell‘Arte performing on the stage. 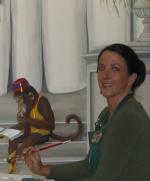 It was created, executed, and donated to Mead Public Library by Mollie Morning Star. In 2010, Morning Star was commissioned by the Mead Public Library Board to create an extension of the mural. 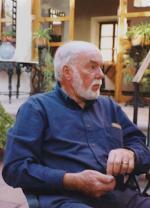 In 2012 and 2013, the Mead Public Library Foundation received 43 paintings by Dr. James D. Michael, gifts from his estate by his wife, Betsy Jones Michael. James Michael died on November 10, 2011 at the age of 83. Twenty-two paintings were included in the 2012 exhibit, “Celebration of Life, Heritage Paintings by James Michael.” They represent some of his personal favorites from 30-plus years of painting. They showcase his evolving vision from traditional historical landscape watercolors to a stronger personal technique, similar to the richness of oil paintings. The ten paintings in the 2013 gift were designated by the donor to honor retired Library Director Sharon Winkle. Two other paintings included in the first floor exhibit had been given to Mead Public Library previously: depictions of the John Michael Kohler home from an anonymous donor; and of the steamer Sheboygan, purchased by the Friends of Mead Public Library with donations from community members. Eleven paintings, included in the 2012 gift from the estate, hang in staff areas of the library building, at the request of the donor. These may be viewed by prior arrangement with the library’s Administrative Services staff. After 29 years as a physician in the Internal Medicine Department at the Sheboygan Clinic, James Michael retired to paint full time and ultimately to teach watercolor painting at the John Michael Kohler Arts Center, Plymouth Arts Center, and the Clearing in Ellison Bay, Wisconsin. He exhibited locally and nationally, and became a signature member of the Wisconsin Watercolor Society (WWS), the Transparent Watercolor Society of America (TWSA), the National Watercolor Society (NWS), and the American Watercolor Society (AWS) and has been the recipient of numerous awards. More than a thousand of his paintings hang in private and corporate collections, and many were donated to local charity benefit auctions including fund-raising events sponsored by the Friends of Mead Public Library. James and Betsy Michael have had a long history of support for Mead Public Library and are charter members of the Mead Public Library Foundation’s Renaissance Society, and for that, the Sheboygan community is grateful. 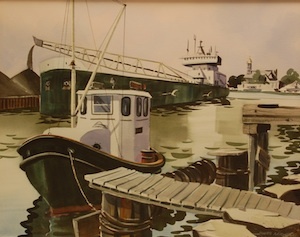 The collection of Sheboygan watercolor paintings by former Sheboygan resident Ruben Vega is exhibited in The Loft, on the third floor of the library. It was the gift of the Kohler Foundation, Inc. to Mead Public Library for the enjoyment of the public. 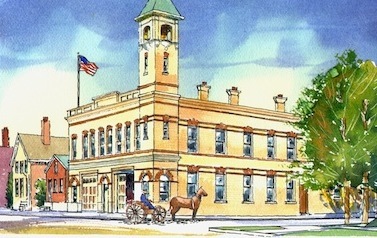 The paintings are based on original postcard images of historic Sheboygan scenes. A.J. Baum, who was born in 1875 and passed on in 1952, was an artist and nationally known furniture designer. He studied at the Cincinnati Art Academy, the Art Students’ League in New York, and with portrait painter and muralist Frank Duvaneck. He also studied industrial design at the South Kensington School in London. He worked as a portrait painter and muralist before entering the industrial design field. He moved to Sheboygan in 1924 to join the Phoenix Chair Co. In 1932, he became a designer for the American Chair Co. He also designed costumes and settings for two productions of the Community Players. He was married to Katherine O’Connell and they had two children, John V. and Madge Therese. In 1945, he and Sen. G.W. Buchen did a series on historic Sheboygan County which ran each Friday in The Sheboygan Press — Baum doing the drawings and Buchen the stories. They were among the most popular items ever published in The Press. 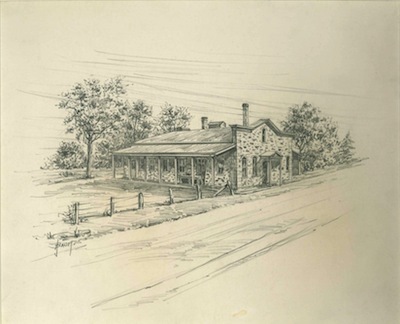 In 1952, a few months before he passed on, Baum presented 39 of those original drawings to Mead Public Library. They were hung in the first floor of the library, but were recently removed for archival preservation. The images and text remain under the protection of U.S. Copyright Law. Thank you to The Sheboygan Press for giving permission to publish the images and text on the library's website. The drawings have been posted in four parts, in the order they were hung in Mead Public Library.